Badan Nasional Penanggulangan Bencana - BNPB is the national agency for disaster management of the Republic of Indonesia. BNPB is a non-ministerial government agency in Indonesia which oversees disaster management affairs. BNPB is based in Jakarta and its head office registered at Jl Ir H Juanda No 36 Jakarta Pusat. The Organizational structure of BNPB comprise of Deputy Prevention & Preparedness, Deputy Emergency Management, Deputy for Rehabilitation & Reconstruction, and Deputy Logistics & Equipment. According to information found in BNPB's website as cited by JobsCDC.com, BNPB was first established in 20 August 1945 and originally registered as Badan Penolong Keluarga Korban Perang (BPKKP) or the Agency for Assisting Families of War Victims. In 1966, the Government of Indonesia established Badan Pertimbangan Penanggulangan Bencana Alam Pusat (BP2BAP) or the Advisory Board of Central Natural Disaster Management. 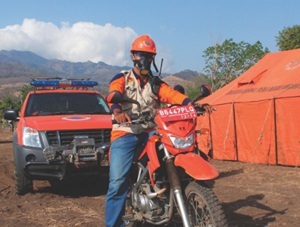 BNPB was established as a non-ministry government agency under the Presidential Decree No 8 of 2008 on the National Disaster Management Authority of Indonesia. JobsCDC.com now available on android device. Download now on Google Play here. Please be aware of recruitment fraud. The entire stage of this selection process is free of charge. Badan Nasional Penanggulangan Bencana - 123 Formations D3, S1, S1 CPNS BNPB September 2018 will never ask for fees or upfront payments for any purposes during the recruitment process such as transportation and accommodation.